If you are visiting Sorrento during your vacation in Italy, you shouldn't skip a day trip to the island of Capri. Though there are a number of agencies which offer organized "all inclusive" tours, you can easily organize an excursion to Capri on your own. How do I get to Capri from Sorrento? It's easy! Simply take one of the ferries which depart daily for Capri from Sorrento's port. Ferries run frequently from April through October, but can be quite crowded with other day trippers. We suggest you buy a round trip ticket and reserve ahead of time to avoid the long lines, especially during the month of August. Take a seat on the left side of the ferry for the best views of the coast between Sorrento and Punta Campanella. Ticket Price: from EUR 14.70 to EUR 18.30. What is the difference between the high speed ferry and the ferry? Ferries and slow ferries are cheaper and slower than fast ferries. We recommend taking a ferry if you are on a budget or if you suffer from sea sickness. Tickets for the funicular and the buses on Capri can be purchased at the tabacco shop ("tabaccheria") at the port of Sorrento. We recommend purchasing them here so you won't have to wait in line at the ticket office once on Capri. At the Marina Grande port, there are always crowds of tourists during the summer months, so it's better to have an itinerary for visiting the island in mind when you disembark so you can quickly get away from the chaos around the pier. 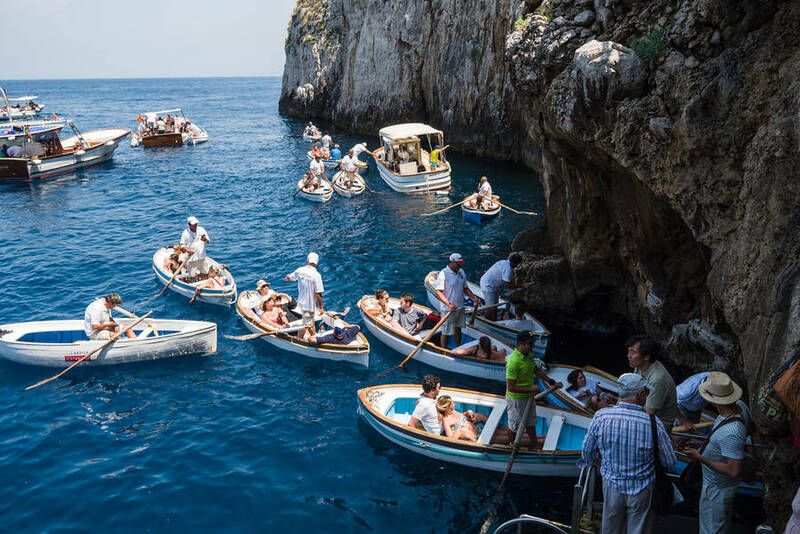 Boat tour to the Blue Grotto: If the Blue Grotto is on your bucket list, it's best to visit as soon as you disembark on the island in the morning, to avoid the long lines which form during the day. At the Marina Grande pier, there are ticket offices for the Laser and Motoscafisti boat tour companies, which offer tours of the island by sea and boat transfers to the Blue Grotto. The ticket to enter the Blue Grotto can only be purchased directly at the grotto and costs EUR 14. The entry ticket is NEVER included in boat tours or transfers. 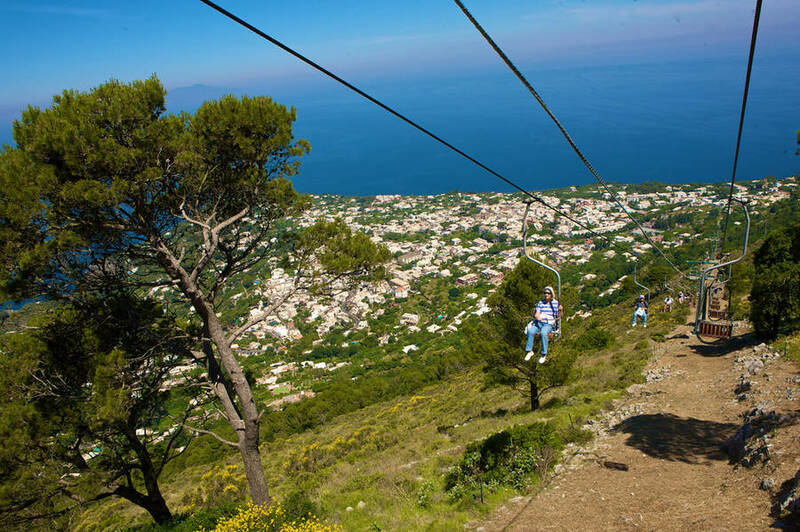 Chairlift for Mount Solaro and Villa San Michele: From the Marina Grande port, you can take the bus directly to Anacapri. From here, you can board the chairlift which takes passengers up to the top of Mount Solaro, where you are treated to an unrivaled view over the island and sea. Afterwards, stop in to visit Villa San Michele, just steps from the chairlift departure. La Piazzetta: Take the funicular from the port up the cliffside to Capri town's famed Piazzetta in just 4 minutes. 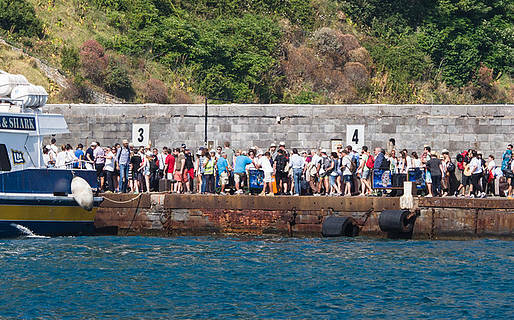 Unfortunately, it may take much longer than that to simply board in high season due to the crowds. Your best bet is to arrive as early as possible in the morning: purchase your ticket ahead of time from the tobacco shop at the port of Sorrento and head to the funicular (the tunnel right in front of the arrival pier) immediately after disembarking on Capri. From the Piazzetta, you can take a walk to the Gardens of Augustus and along Via Camerelle to Punta Tragara. If you want to have a quick lunch rather than a full restaurant meal, you can pick up a traditional panino caprese made with fresh mozzarella and tomatoes at the "Da Aldo" deli in Marina Grande (considered the best on the island), or sample a traditional dish at "Capri Pasta", which prepares ready-made take-out near the Piazzetta. A refreshing gelato from Buonocore is also a great pick-me-up. If you would like to sample traditional island cuisine without breaking the bank, try the Verginiello restaurant/pizzeria in the center of Capri. For excellent food with a view over the Piazzetta, we suggest Pulalli, a small restaurant on the square's clocktower. One of the inconveniences each year on Capri during the May to September high tourist season are the numerous groups which descend on the island for day trips, creating long queues at for the funicular and bus. Crowds can be especially problematic in July and August, when visitors are forced to wait under the hot sun. During these busy months, you may find it hard to follow our suggested itinerary, so consider instead spending the day on board a boat touring the coast or relaxing on the beach, and saving your stroll through the Piazzetta for the early morning or late afternoon. 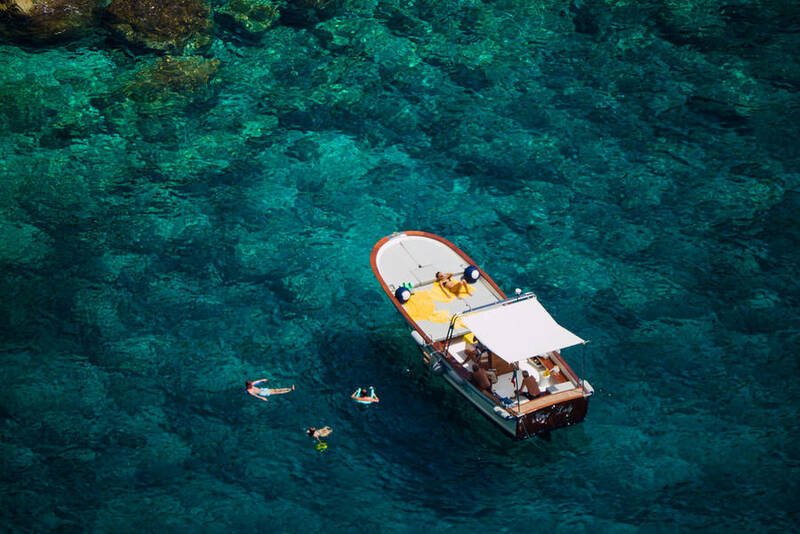 Package including a boat tour, seaside restaurant lunch, and beach club pass: this package offered by Bagni Tiberio is perfect if you want to experience the best of Capri's seaside with an "all-inclusive" package. If you arrive on the island in the early morning, you can reach the Piazzetta with the funicular for a leisurely cappuccino and stroll through Capri town before the crowds arrive. When the day starts to heat up, you can take the funicular back down to Marina Grande in just minutes and set off for your boat tour. 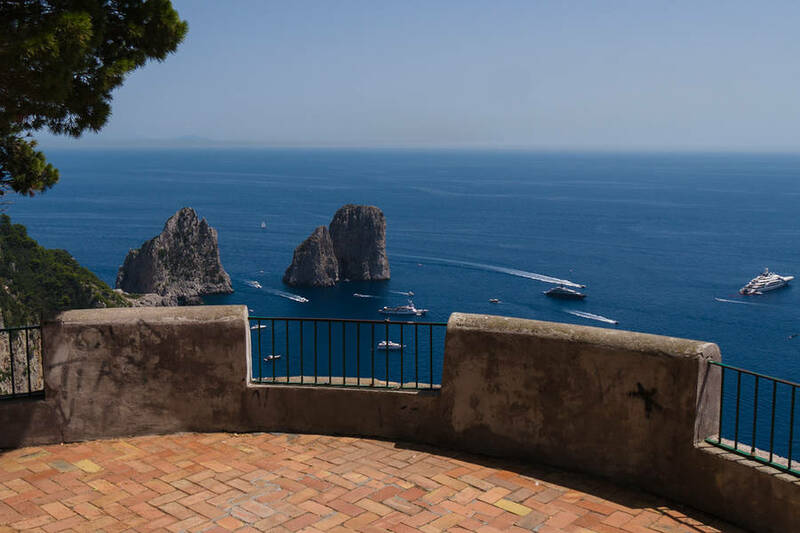 Capri Day Tour: This all day package includes a self-guided itinerary in both Capri and Anacapri, plus lunch and a boat tour around the island. 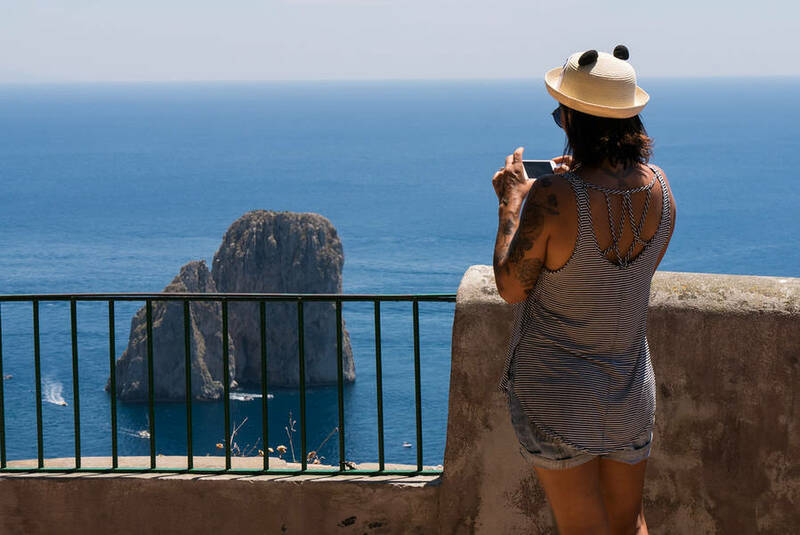 The advantage to this all-inclusive independent package is the private reserved bus from the port to Anacapri, so you don't have to wait in endless lines under the hot sun for the public bus! How much does day trip from Sorrento to Capri cost? Should I book an organized tour of Capri? Capri is very small (just 10 square kilometers) and can be seen without the help of a guide, but getting around is often complicted by the long lines to board the public buses and funicular. In high season, consider booking a tour by private minibus to be able to see everything with no delays. An excellent alternative to visiting the island independently is joining a semi-private boat tour from Sorrento to Capri. These tours depart from Sorrento on boats for 10-12 passengers, stop near Punta Campanella for a swim, and then continue on to Capri. Once at Marina Piccola, passengers disembark for a few hours of free time to visit the center of Capri town or have lunch in a seaside restaurant. Afterwards, the tour circles the island before returning to Sorrento.